The FRÍO® wallet is classified as a medical device. The wallet carries the CE Mark (Class 1 Medical Device) and this mark is shown on the product label. The FRIO® maintains the required temperature range – room temperature – for in-use insulin. Please note that it is not a ‘fridge’ alternative. Many ‘in-use’ medications can be stored or transported at room temperature – check your manufacturer’s information leaflet for your specific medication or, for further assistance, call (925) 937-5288. How long is In-use Insulin safe in a FRIO®? 28 days (one month) – this is the life of most* in-use insulin. *Check your manufacturer’s information leaflet for your specific medication, noting that Novo Nordisk states 6 weeks for some brands but it is essential that you check the leaflet. The FRIO® travel wallet is an evaporative cooling unit, purposely designed to keep in-use insulin cool within safe temperatures of 18-26°C (64.4-78.8°F) for 45 hours minimum, even in a constant environmental temperature of 37.8°C (100°F). The wallet can be ‘re-activated’/’topped-up’ to provide continuous safe storage conditions for subsequent periods of 45 hours minimum for up to 28 days (one month). Note: insulin must be at the manufacturer’s recommended temperature before being placed in the FRIO® wallet. Please check the manufacturer’s information leaflet for your specific medication. What do I need to do to ensure that my FRIO is working? 1. Activate the inner pouch in water. You will need to soak the wallet according to the instructions. The gel formed should fill the panels but should not expand to the point where the panels become rigid. The activated pouch should remain pliable. Re-soak the inner pouch when the gel tubes are less “puffy”. 2. 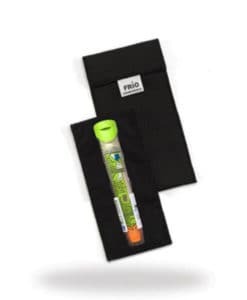 For continuous safe storage, the FRIO® inner wallet should be re-immersed in water every 45 hours or sooner if the quantity of gel reduces and starts to return to its crystal form, i.e. crystals can be felt in the panels. When in continuous use, succeeding immersion periods should be shorter (3-4 minutes) as the crystals are already in gel form. 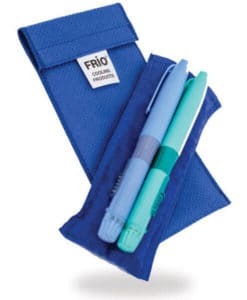 Do not forget about your FRIO® while it is soaking in water as over soaking causes the wallet to become too swollen to be used. Should this occur, the wallet must be allowed to dry naturally until it returns to usable size. 3. FRIO®s need to breathe. As they work by evaporation, they need to be in contact with the air. Carrying in hand luggage or a pocket is satisfactory. DO NOT CARRY OR STORE IN AN AIRTIGHT CONTAINER AFTER THE FRIO® IS ACTIVATED. What is the FRIO®’s average life span? The FRIO® has a manufacturer’s guarantee of 12 months. Meanwhile, many of our customers have advised us that their FRIO® has lasted for several years, but this will depend on how often it is used and how well it is cared for. Due to varying climatic and environmental conditions around the world, a FRIO® will respond differently and age accordingly. If activated and used sensibly it will continue to respond to your needs over a long period of time. With age, the length of immersion time will increase but as long as the crystals expand into a gel it will function properly. When the crystals fail to expand, it is time for a replacement. Note: the FRIO® is re-usable; the life of ‘in-use’ insulin is one month. Can a FRIO® be used for other medication? Yes, FRIO® wallets can be used for other medications that can be stored at room temperature. We strongly recommend that users of medication other than insulin ask their GP, pharmacist or the medication’s manufacturer for the safe travel data/safe travel allowance of their medication. Note: the wallet does not keep medication as cold as a ‘fridge’ would (2-8°C (35.6-46.4°F)), but it does keep medication cool within safe temperatures of 18-26°C (64.4-78.8°F) for 45 hours minimum, even in a constant environmental temperature of 37.8°C (100°F).